Former Thurston County Sheriff Gary Edwards is running for county commissioner. So, it would make a lot of sense that he's making public safety (more cops on the streets, or deputies on the road) a campaign priority. 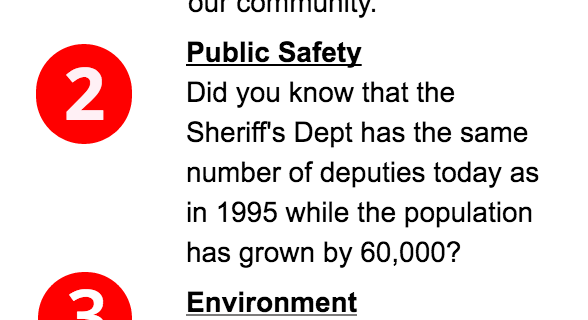 I can't disagree with his statement that the number of deputies hasn't increased in over 20 years, but I thought I'd check his population numbers. As I've been reminded, the Thurston County Sheriff only works in the unincorporated parts of the county. So, "the population" that his statement refers to must be the unincorporated population. Otherwise, the statement wouldn't be unnecessarily inflated. But, either way, he's wrong. He could use the top number, the total difference between Thurston County in 1995 and right now and be closer to his 60,000 number. But lumping in the populations of cities covered by their own police forces would be misleading. Or, he could cut his number in half and be more accurate. But, the number would seem less impressive, especially against a six figure total population figure. What really impacts me is that this table took me all of ten minutes to put together. Getting the accurate number wasn't hard for me, Edwards should have bothered to do the same work. Not doing so make it seem like to me that this is more along the lines of something he heard somewhere and decided to make a campaign platform. It is also worth noting that a total population is not a very good standard for judging the effectiveness of policing. What would be a better standard would be comparing crime rates in 1995 and 2016, right? Here is some math Emmett will appreciate: https://www.wethegoverned.com/thurston-county-invents-42000-gopher-tax-for-new-homeowners/ , and note that this article has been shared on Facebook 6.4K+ times over the last month - more math that can be appreciated.